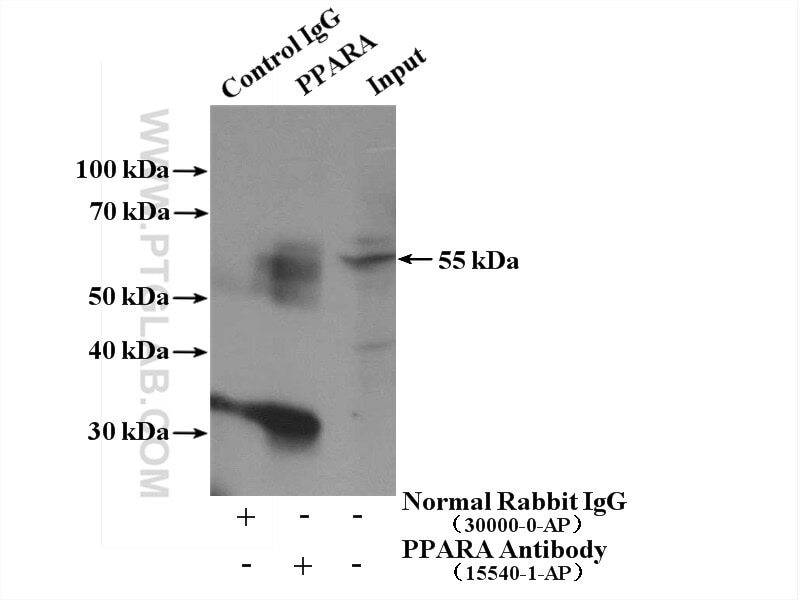 IP Result of anti-PPARA (IP:15540-1-AP, 4ug; Detection:15540-1-AP 1:300) with U-937 cells lysate 4000ug. 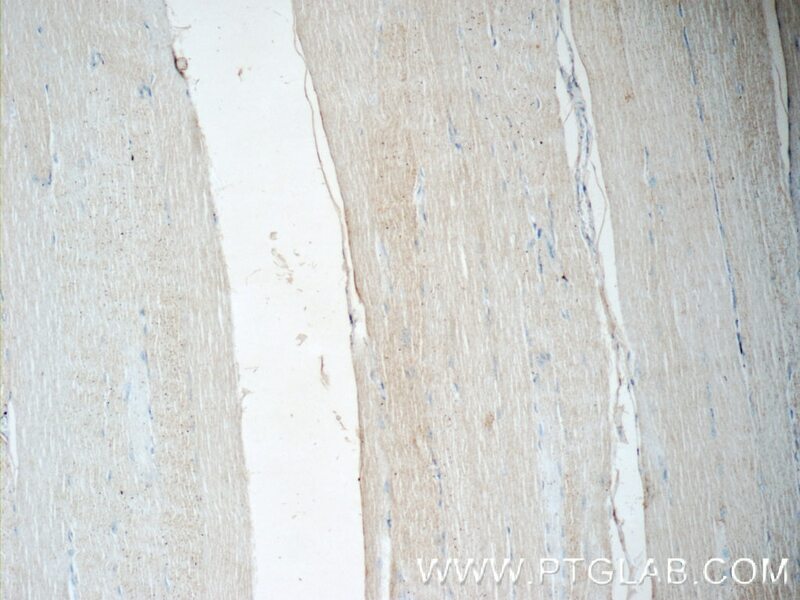 Peroxisome proliferator-activated receptor alpha (PPARA) is a ligand-activated transcription factor that belongs to the PPAR nuclear receptor superfamily. PPARA is essential in the modulation of lipid transport and metabolism, mainly through activating mitochondrial and peroxisomal fatty acid β-oxidation pathways. In addition, PPARA seems to decrease inflammation mainly through direct interaction with NF-κB, causing inhibition of its signaling pathway or reducing the activated levels of NF-κB and subsequent inflammation. 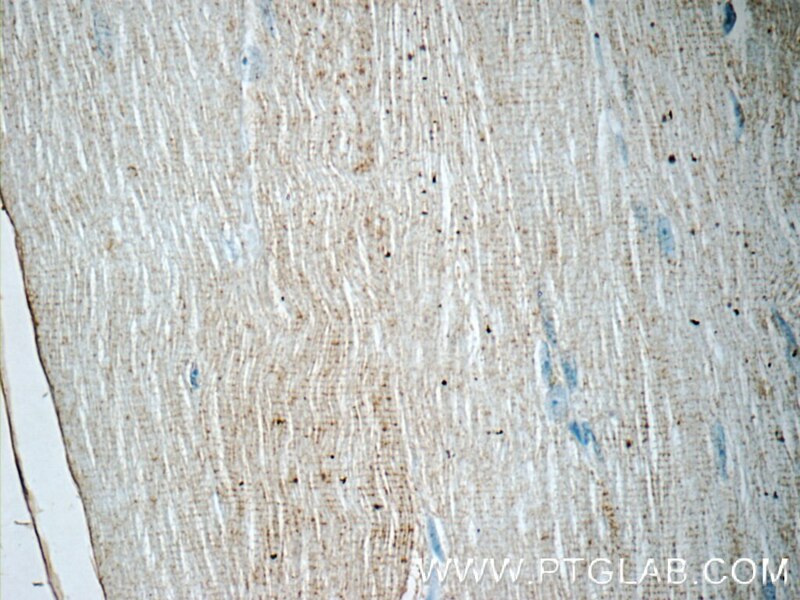 Furthermore, PPARA was implicated in the attenuation of oxidative stress in alcoholic liver disease when treated with polyenephosphatidylcholine through downregulation of ROS-generating enzymes such as ethanol-inducible cytochrome P450 2E1 (CYP2E1), acyl-CoA oxidase, and NADPH oxidase. 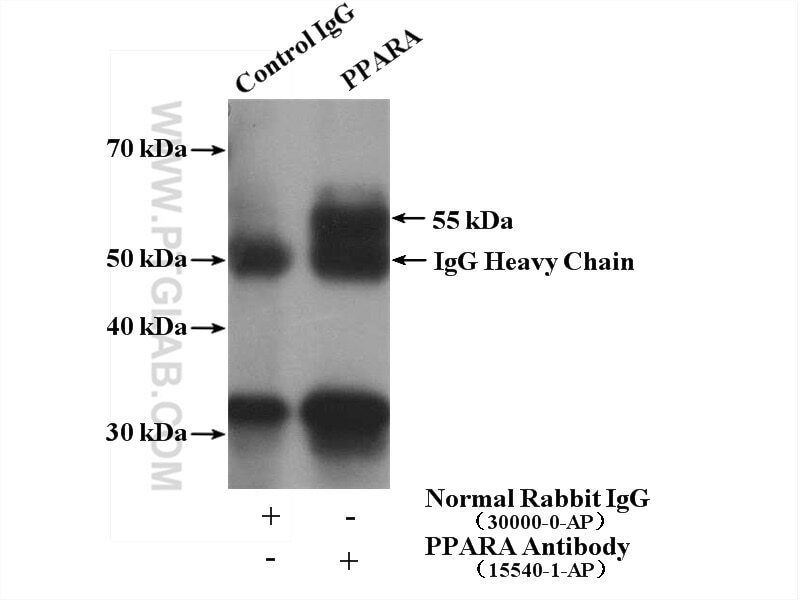 PPARA exists two isoforms and molecular weight of PPARA isoforms are 52 kDa and 22 kDa. The ability of a retinoid X receptor (RXR) to heterodimerize with many nuclear receptors, including LXR, PPAR, NGF1B and RAR, underscores its pivotal role within the nuclear receptor superfamily. Among these heterodimers, PPAR:RXR is considered an important signalling mediator of both PPAR ligands, such as fatty acids, and 9-cis retinoic acid (9-cis RA), an RXR ligand. (PMID: 15103326 ). PPARA can form Heterodimer with RXRA and molecular weight of Heterodimer is about 110 kDa. Neurotensin contributes to pediatric intestinal failure-associated liver disease via regulating intestinal bile acids uptake. Effects of mulberry leaf on experimental hyperlipidemia rats induced by high-fat diet. Multi-scale, whole-system models of liver metabolic adaptation to fat and sugar in non-alcoholic fatty liver disease. EETs/PPARs activation together mediates the preventive effect of naringenin in high glucose-induced cardiomyocyte hypertrophy.